July | 2015 | Life is a Crooked and Varied Path. Get On It! I made this comment in the commons, because this time around I was going to try to spend more time in there, but I’m kind of losing track of the goals I made. Literally. There’s bonus points to “detail my goals and publish” because going public ups your accountability, except, I have waged a war on accountability. I don’t do things to pass or fail in public. OR as a means to stave off failure in public. BUT it doesn’t mean that I can’t be public about things, so usually, I just work around that advice to keep on keeping-on with what I am doing. No harm, no foul, no limitations. Anyway. *To establish myself as a leader in my field? I guess I am developing my field. I have a couple paths that I have been trekking to see which one catches on. That is why I blog, I found my voice, I need to find a way to channel it. *I want to get past 200 followers, with a stretch goal of 300 followers. Actually I want my mind blown for the increase in followers, but I will take over 200. *In Blogging 101 I was going to create a Fruity Friday feature, but I never got out of the gate. But I think I may turn that into an event along with the “wildest dreams” bullet point. We’ll see. *Then of course to finish Blogging 201. It took me three tries last time, but I got my blog up to where I wanted it to be, so I’ll see. I changed my background color from terra cotta to a light yellow. Although cheerful it sure is bright and I think this is why I choose terra cotta in the first place. Plus I thought the terra cotta and red would give it a designers edge but I was wishing for a way to inject purple in there. Especially in the widgets. Anyway… I’m going to see if this effects my stats at all before I switch it back. Content? I think I do a pretty good job of keeping the thread running through everything. In fact if I need work in this area, it is probably an exercise to throw something random in there to attract a new audience. Mostly everything is grounded to the basic tenants of manners that are Patience, Kindness, Goodness, Faithfulness, Gentleness, and Self-control. Hence my war on accountability, my work in finding motivation through non-motivation techniques, quitting smoking, women in the work place and cleaning house. Even though it may not seem like it, I see that it is there and that itself, is the point I am trying to make. While it may seem like I have a smattering of topics, I see the basic thread. 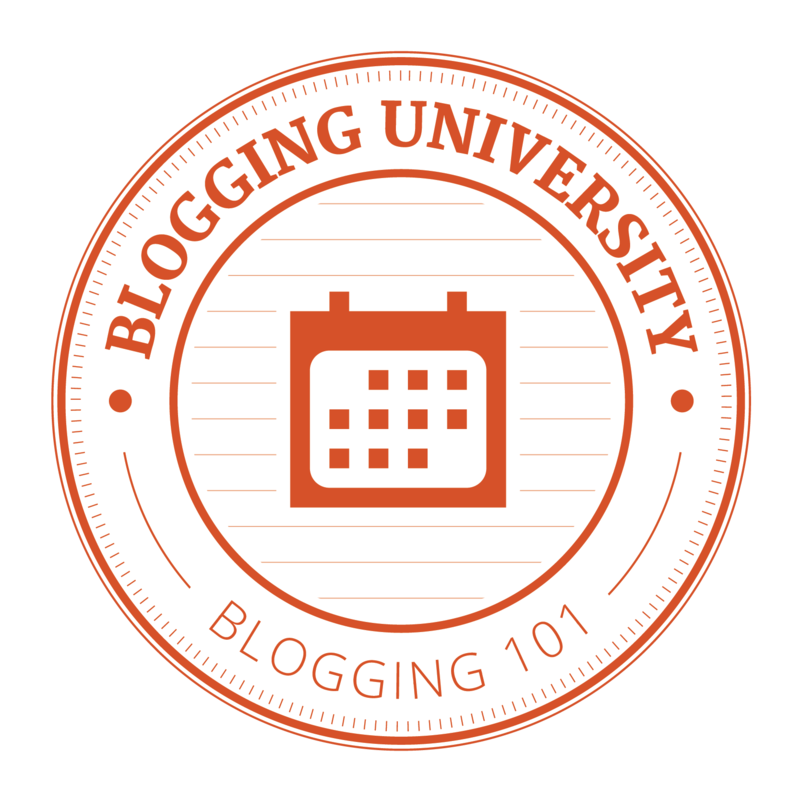 The practice for writing the blog is to not make it preachy or rantish as it is very easy to fall into these two categories without meaning to. I think I have a running theme with the crooked path, winding trail, widget titles and blog entries, tag lines. This explains the thread about my content. I need to work on some widget titles. I had the idea and I acted on that idea before it was fully fleshed out. It kept me thinking about it and now I think I found the fix and I just need to follow through with rewording some widgets. Might happen today… definitely next week. test blog?!!! https://dailypost.wordpress.com/2013/10/30/test-blogs/ WOW! What an Idea! Put that one on the list. It would be nice to see “all time” results but right now all I can see is either 2014 or 2015 results. Even though my readership has grown my hit count has stayed the same at 22 for the #1 spot, but I posted more last year while building my blog, doing NaNoBloMo, and participating more in the commons during my first time with Blogging U. These results could be slightly skewered because I did not include really random off topic stuff or posts that were specific blogging U lessons, (i.e. Introduce yourself, visit 5 bloggers and ping back). Not only because they were off topic, but also because the readership is generated as we are supposed to go seek out others as part of the assignment. I could also tell that with NaNoBloMo, I got a little off topic with trying to create daily posts. There are a lot of “in the moment” posts. Good for bulking up my blog, but may have put a small dent in the character of my blog. Especially when the posts started to center around whining about not keeping up or cheers that I am. Okay! 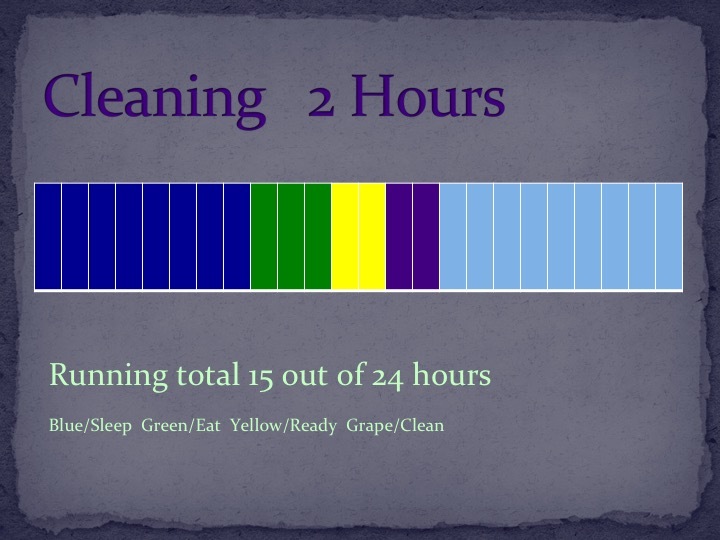 Two hours a day on cleaning tasks. This one I can back up with Science! Yepper! Like seriously. Two hours. Actually several reports on Chore Wars between the sexes already exist, so I’m not going to repeat any of that. This post is about the war against time and if there is enough time to meet our personal standard of clean. It would be nice if we could agree on a standard. What used to announce health and vitality, is now used to judge the extremes of a person’s mental health. These extremes classify people as neat freaks who live in fear of dirt and germs, or people pleasers who care too much about what people think, to judging them as hoarders, or immature and incapable of taking care of themselves. Then there are those who can go nuts trying to find the perfection in imperfection by striking a balance between neat freak and slob. All that effort can be useless as standards in cleanliness can be subjective. One person’s clean is another person’s dingy. There is A LOT of ground between the health department’s standards, and the collective proclaiming there is no shame in having dishes in the sink and dust bunnies under the bed. Cleaning is one of the most challenging demands for the fact that it never ends. The minute laundry is done, someone takes their socks off. Plus. No matter how much you’ve done, you can always go deeper to clean out the cupboards and get behind the TV. Then, when you think you’re done, it’s time to repeat what you did yesterday, last week, last month. …Or, what about last season? If cleaning is so perpetual, when does a person sit back and actually take satisfaction? Where’s the win? Seriously. With all the competition in the world, when does a person win at cleaning? The proof that we seek this knowledge is all around us. Tips and tricks are everywhere you look. Some come with suggestions to buy that tool and create this organizational tasking aid. But still, does anyone talk about … or teach how to incorporate cleaning into the day without a fight to get it done? Especially, without the money investment. Especially, when time is limited. Especially, when there are other things to do… and those things are a lot more fun. Learning how to clean is filled with conflicting messages. For example. If we snagged breakfast and left dishes in the sink before work, (because we were breaking free from the chains of the home to go after what the men have,) only to return with dishes still in the sink, we find this unfair, because we went to work. (This is what we we’re taught? Right?) So then we look to the men to get it done, BUT, they just got home from work too. When we come home from work only to continue working in the home, a conflict clicks inside us and throws a BIG clue that something is not working. Wasn’t something said about freedom? Yeah! Where’s that freedom? Still, no matter what the exterior pressures are, at the end of the day, there’s your own personal pressure of sitting in your mess and feeling like you can’t ever get it together. (No matter how clean your house is.) AND, once you find your comfort zone there is nothing like unexpected visitors to force that inner conflict to the surface. All of this leaves out the very important message that to clean is to take care of yourself …and your stuff. Its not about catering to the husband or taking care of the kids. It is about taking care of yourself. So, how does one teach to incorporate cleaning into the day anyway? After all there are so many variables for everyone, small house/big house, single/married, working/home, child/children. Even my joyous claims of scientific proof are deluded by specifics. Usually, they include chores like cooking and mowing while I allocated those to their own categories such as Eating and Home maintenance. So how does that still add up to two hours a day. Eventually I quit quibbling and got out the stopwatch. This is what I got out of my little timing experiment. If I were to start a load of laundry correctly, the way I think I should but never do, it takes me 7-10 minutes to check every pocket, zip every zipper and look for stains. Ironically, (or duh, go-figure) when those same articles are dried, it takes me 7-10 minutes to fold and put away. (My duh moment came when I realized that if I am handling twenty articles of clothing going in, I’m handling those same articles coming out and it doesn’t really matter what I’m doing with it.) For one load of laundry, I’m only putting in 20 minutes of effort. Humph, and I had the idea that laundry took all day. Don’t take my word for it. We’ll have differences, such as, I don’t have to run up a flight of steps to put laundry away. I know some of you do, so get a clock or grab your phone and go time yourself. But to finish my point, my daily chores are 1-2 loads of laundry at 20 min each, unload the dishwasher at 7 min, tidy up the main floor 2x a day at 5 min, then to tidy the bathroom, clocks us in at over an hour. (Tidying the bathroom normally happens when I’m in there; I don’t go in just to tidy it up so it usually gets it’s own time.) Remember, all this doesn’t include loading a dishwasher or a wiping down kitchen counter tops because that gets done with meals. Now we run into variables, do you vacuum daily or twice a week? Mop more than once a week? Clean out the fridge monthly or twice a year? Do you have a difference between cleaning and clearing out the fridge? How often do you dust? Then to be honest, I quit timing myself to clean the shower because the length of time goes against the initiative to do it. But now that I have everything else managed, it’s easier to clean the shower every 10 days. …Roughly. (Again, I have differences to where cleaning my shower, although hospitable, involves cleaning a basement wall and floor.) I haven’t even mentioned windows and mirrors. Watering plants? No wonder it’s easy to forget and plants die. To summarize if I were to do the daily chores, along with one weekly, monthly or seasonal chore, I’m clocking in about 2 hours a day. Give or take about 20 minutes. Not living up to expectations wrecks a good vibe, so I reorganized everything, my stuff, my thoughts, my actions, and rose up to meet my expectations before I lowered them. Truthfully, some expectations were lowered without feeling the expense of doing so. Some concerns just disappeared off the radar without training myself to put up with lesser quality of work. It’s not perfect by any means and I don’t apologize for dishes in the sink or the fact that it is time to dust. Besides in order to dust it needs to get dusty. I gained consistency and I get more done than I ever used to. At the end of the day, the goal is to feel good about managing MY home. It has changed my self-assesment of half-assed and not quite right. I figure this is where I truly cleaned without worrying about people’s expectations, because I had actually met my own and not other people’s. The pressure is off and I enjoy the mundane. I found my comfort zone. Doing chores while upset is virtually non-exsistant as I don’t need get angry for the rush of energy anymore. It did take some effort to change my attitude as I started out chanting enjoy the mundane, it quickly turned into muttering while I flung stuff around. Eventually, I figured if I can’t force myself to be happy, (which I related to lying) then don’t be angry. It worked, I am now content with the mundane. I’m late only some of the time now. I have better judgement of time. For all the stuff I used to think will only take a minute, I now know it actually takes 3-5 and will make me late. Better perspective. Laundry takes less than 10 minutes to fold and put away, and not all day and I don’t drag loads in front of the TV to fold and sort. I quit saying (and believing) there is no time because there is time. I used to think that I had to do it now or it won’t get done and I found out that doesn’t prove true. Now, I find a better time to get it done right. The result is that I found contentment and cleaning has a zen/yoga/meditation quality to it. Cleaning is part of my day and not in the way of it. I don’t wait to feel motivated anymore. Most times I get it done and there is confidence in that. Now, while sitting in my mess at the end of the day I don’t stress as much about it. I am capable.